During the Middle Ages, common folks were taught the Bible via public plays in the town square. Today, drama can be an incredible tool for relaying Bible truths to your kids. You do not have to be an award-winning actor to utilize this avenue of communication when teaching children. You just need a little planning, some preparation, and enthusiasm. Let’s talk about using the strengths in your program and avoiding the pitfalls. There are many reasons why using theatrical techniques can be effective in your program. Here are just a few to consider. When sprinkled throughout your year, it adds variety to your lessons. 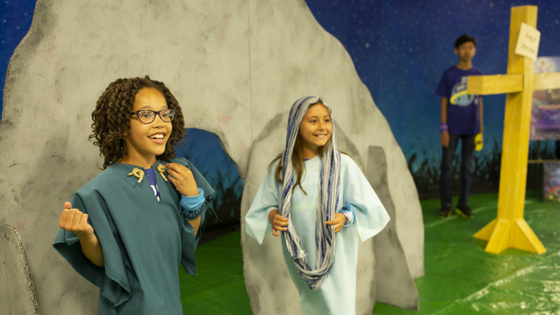 It engages kids because they can "see" the Bible story, helping them relate to it. Acting out these stories encourages you and other staff to think deeper about the story. It doesn’t need to be a huge production. For example, portraying Mary Magdalene around Easter—sharing her wonder and excitement about seeing Jesus—can have a huge impact on your students. Try to memorize what you want to say as it will make it quite a bit more real for your audience. Sometimes making the kids act out a piece of a story and feeding them lines can be meaningful. Children feel like they understand the part they play a little better and feel a connection to the story. Acting it out a couple times with different children chosen also yields good discussion. This all being said, if you feel passionately and inspired to lead a bigger production, God bless you! These can be beautiful presentations for the congregation or families and can build deeper camaraderie between actors and director. Costumes (even very simple ones) do help. 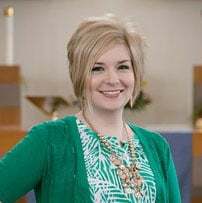 In my second grade Bible class, I would often use the fashion scarf I was wearing as a head wrap to quickly become a Bible character for a moment. My students' imaginations filled in the rest. However, if you have the resources and passion to do a more impressive costume, that will set the stage quickly and be memorable, too. Then when you remove the costume to discuss the story, there is a clear transition so they understand who is a Bible character and who is you. Know your lesson and audience. Write something or find something that truly fits your lesson and that is age-appropriate. I would often use quick monologues as introductions to Bible stories but made sure I only showed and discussed the text about which we were going to talk. Too much extra content can be distracting from your focused Bible lesson. When acting is direct, biblically accurate, poignant and age-appropriate, it also will be effective, memorable, and inspire discussion. Laughter is welcome! Just be careful not to be focused on humor as your goal. Make the character relatable! Just be careful not to change the story completely. One final note: there are a few pitfalls you may want to avoid when incorporating this teaching method into your program. In your preparations, be sure to stay away from these common errors so you can keep the focus on what matters most: teaching kids about God's Word. Pitfall #1: Adding too much non-biblical content. Sometimes we need to infer things from the text in order to act out a character, but be careful not to add facts or theology that wasn’t there. You can change the meaning of God’s word when you do this and that is a dangerous thing. Pitfall #2: Focusing more on silliness than content. Often times in puppet theater, or in VBS openings, I see well-meaning people give in to this temptation. Silliness is a beautiful thing! However, you want the children to remember the story—not just the jokes. Make sure your content is meatier than the goofy.